Once in the hashtag gallery, look for the Follow button beneath the hashtag and above the gallery images. Tap the Follow button to follow that hashtag and start seeing content in your Instagram feed and Stories. Additionally, if at any point you want to unfollow a hashtag, go to that hashtag galleryagain, tap on the Following button, and choose Unfollow from the pop-up menu. While it’s easy to follow hashtags, understanding how they appear in the feed or stories isn’t quite as straightforward. 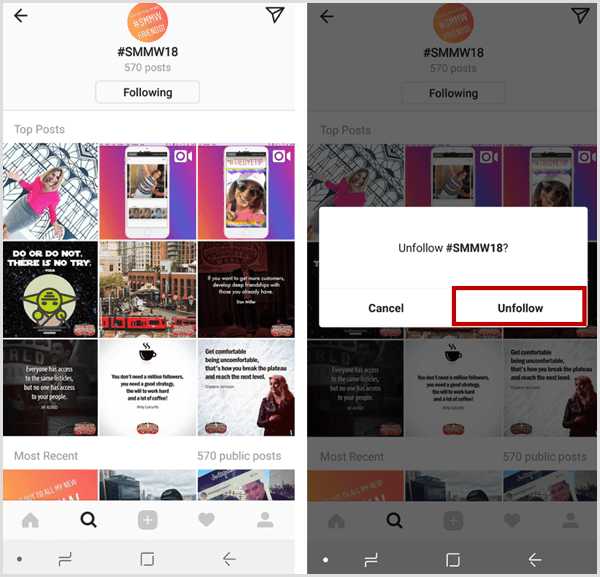 The hashtag post results will appear in the Instagram feed, mixed in with the regular posts of the accounts you follow. Instead of seeing a username in the feed, you’ll see the hashtag listed next to the current photo for that hashtag and the colored hashtag symbol. The user who uploaded the post on the hashtag and any location tag used are listed beneath the hashtag itself. In the Stories banner on your profile, you see a separate story for each of the hashtags you’re following if that hashtag has any current active stories. You can select that story to watch or it will appear in sequence when tapping through the stories of those you follow. Within the stories themselves, the hashtag cover image, colored hashtag symbol, and hashtag name appear at the top of the story along with the creator’s username beneath the hashtag. The story will play through the same way as any other story post. If you see posts you like in the hashtag results in your feed, give them a like or comment so the algorithm knows you like this type of content and will show you more of it. Conversely, if you don’t like a post that appears in your feed, tap on the three-dot icon for that post and choose to hide it from your feed. Depending on the hashtags you choose to follow, there may be a variety of content you don’t want to see. For instance, choosing to follow #goat because you love the animal itself may also expose you to a number of posts of athletes, musicians, or other people using GOAT (greatest of all time). Using the option to hide content and positively interact with the content of your preference will educate the algorithm on your preferred selections and better curate a hashtag feed for you. As a business on Instagram, it can be beneficial for you to follow certain hashtags. Here are some suggestions. If there’s any chance that your audience or customers are creating content with your hashtag, it’s a good idea to follow your own hashtag. While you won’t see every post (you should still search the Explore tab regularly for content on your branded hashtag), the reminder of seeing someone post on your content is a great way to engage with that content creator. Much like the local restaurant example above, finding targeted topics that relate to your audience will help you see what your competitors are doing, what content is generating the best engagement, what’s trending in that space, and moreinformation. You can use this to better create your own content to align with your target audience. I recommend this topic with caution. If you’re running a contest or campaign where people will be posting content using a hashtag you provided, you should ideally monitor that hashtag through the Explore tab or a third-party tool to ensure you don’t miss any relevant or applicable posts. Instagram should always be fun and the content you see should entertain you, although creating quality content on Instagram can get routine and mundane. Finding inspiration from other sources or accounts to keep your feed alive and interesting can be a valuable tactic to enhance your own marketing efforts. Hashtags have long been a source of reach and exposure for businesses on Instagram. However, users had to search for those hashtags to find your content. 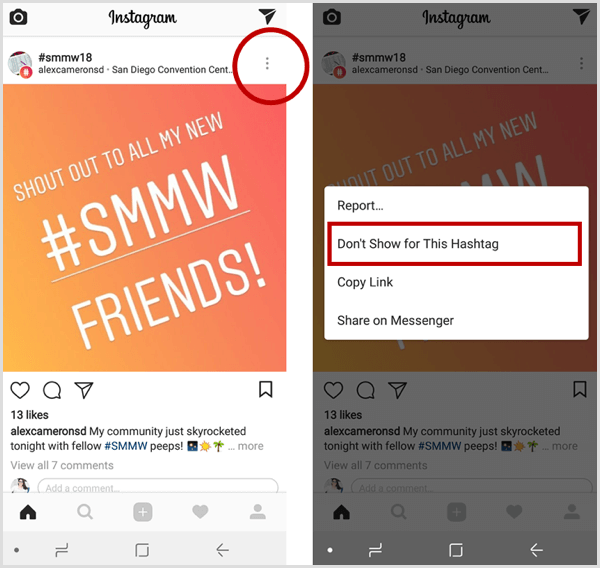 Now, if someone is following a hashtag you’re using, they have the potential to see your content in their feed or stories, whether or not they’re following your business on Instagram. This exponentially improves the chances of being found by new people on Instagram and reaching a new audience. To take advantage of this reach, you need to use hashtags that are relevant to your target audience, not just the super-popular hashtags or your own branded hashtags. For instance, if you manage a local business, consider using hashtags related to your geographic area and industry. Using #SanDiegoRestaurants is a great idea for a local San Diego eatery, bar, restaurant, or deli. This is a targeted hashtag that customers are likely to follow and will allow your content to potentially appear to new audiences in your target demographic. If you use a branded hashtag for your business, you can also encourage your audience to follow that hashtag on Instagram. This may introduce them to new content related to your brand and ensure they see more of your posts if others are falling lower in the algorithm. Following hashtags on Instagram is easy, but finding the right ones with the right content may take some time. There are advantages to doing so and hopefully you’ll find them helpful to your brand development. This new feature is a good reminder to ensure you’re using strong, effective hashtags in your posting strategy to provide more opportunity and exposure for your business. What do you think? Are you planning to start following hashtags? Do you have any recommendations for types of hashtags to follow? Please share your thoughts or tips in the comments below.